So, here is a special treat for you. I received the Grab Box. Now because I am new to Sketchbox, I am not sure how often they release Grab Boxes, but according to the website, it sold out in a matter of days last time, so I pre-ordered mine. Boy was I surprised when it showed up. It was heavy and you could tell it was packed with a lot of great products! Usually, I do my unboxing straight on the camera, but because this was a special box, I wanted to make sure I did my research on the products. I’m happy that I did open it because there was no product description card. So, let’s go through everything that came inside. The box cost $49.00 and I didn’t pay to ship. Now, something I should mention is that I priced all of these items according to Amazon. The only thing I couldn’t find on the Amazon Website was the Faber-Castell Eraser Pencil pack at the bottom of the list. With these prices, I saved $71.52 on art supply products of high quality. This is a great deal for anyone who wants to try something new and challenge themselves to use new products. You never know if you are good at the different mediums if you never try them. Ok, let’s go through each product now. I have never used Oil Pencils so I will have to research how they work before I can give you a review. But according to the information, they will not smear and are effective on multiple surfaces. The six colors that came in this pack are classic white, sanguine, sepia light, sepia dark, nero-soft, nero-extra soft. The colors that came with this set are Dark Pink, Deep Blue, Olive Green and LIght Brown. I have tried these only to show the colors. I did notice that they did not bleed through the Fabriano Sketchbook that also came with this box. These brush pens claim to be blendable, but I have yet to blend them. 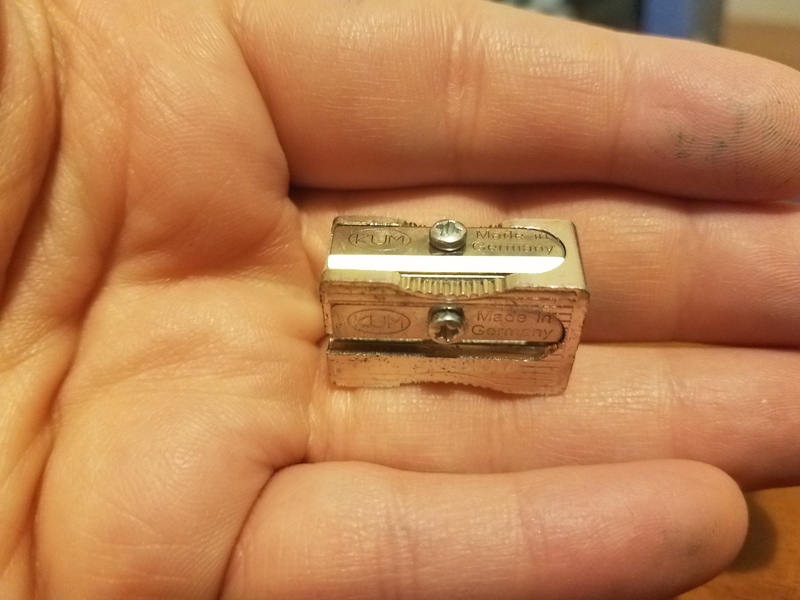 This sharpener is not like the average sharpener you get for everyday pencils. The feel of this is so nice, as well as the fact that it comes with an additional blade screwed into the side for when the initial one gets dull. This sharpener is made of magnesium alloy and made in Germany. This product looks like a Copic marker in that the barrel is shaped with flat edges to prevent it from rolling off the table. It claims that the cap matches the ink closely. 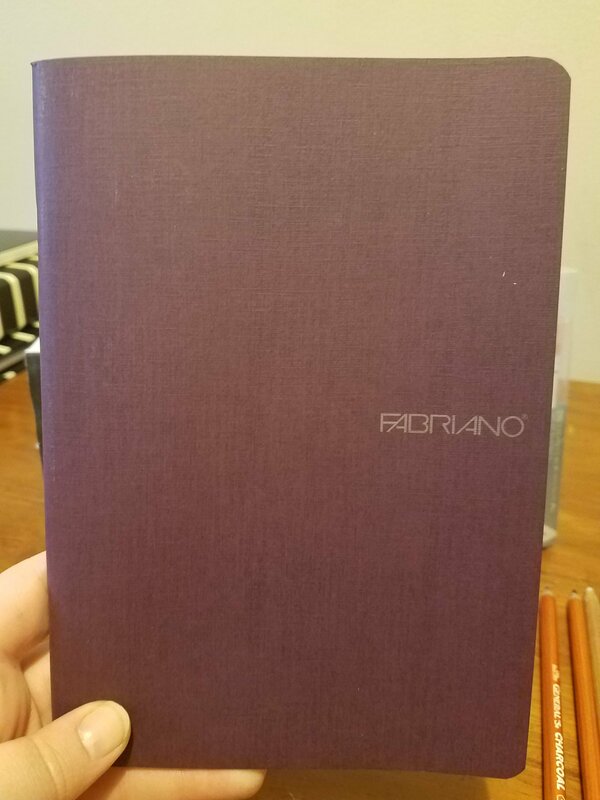 When I tested this ink out on the Fabriano Sketchbook included in this box, the ink bled horribly onto the back side, I am not sure if this pen requires a different type of paper or if it just drops a lot of ink. Until I have a full set and can experiment with different types of paper, I can’t be for certain. Let me put out a disclaimer to let you know that I have never used charcoal before, however, when I used them to test them in the sketchbook, I found that they act just like I would think charcoal would. It smeared and smudged and ended up all over the side of my hand, but the color was smooth, rich and intense. The two I got were 2B and 6B, but it comes in HB, 2B, 4B and 6B. I tested the blender out with the color pencils that we will mention below and I have to say that I was pleasantly surprised with how rich the color pencil was after using it. I haven’t used the Burnisher and if you know exactly how I would love to know in the comments below. I got two beautiful colors. Sky Blue and English Lavender. These look like they are going to be fun to use. I thought about using them in my bullet journal because I thought that maybe with the muted colors, it would be pretty, but when I tried them out, they showed a little darker than I thought they would. These will require more testing before I can really let you know what I think. I used this in the sketchbook and it bled through. This reminded me a lot of a Sharpie, the way it bled through the paper, and yet it was very rich in color. I did not really see anything that sets this permanent marker from any of the others on the market. Let me tell you, I was so skeptical of this sketchbook. I thought for sure that everything would bleed through the pages because they seemed thin and very smooth. I received the Rasberry Color, 40 pages, 5.8″x8.25″, 85gsm/60lb plain sketchbook. It was made in Italy. After using all the different products, which I will show you in my art supply review, I was pleasantly surprised at how well the pages stood up against the testing. The pages are extremely smooth and I used mixed media to create a full art piece. Beautifully crafted with recycled cedar wood and finger joint technology which reduces waste and conserves our environment and forests. Lead is hard and dense for precise details and sharp lines, strong pigment for deep color saturation, blending and layers. Set is packaged in a reusable metal tin. 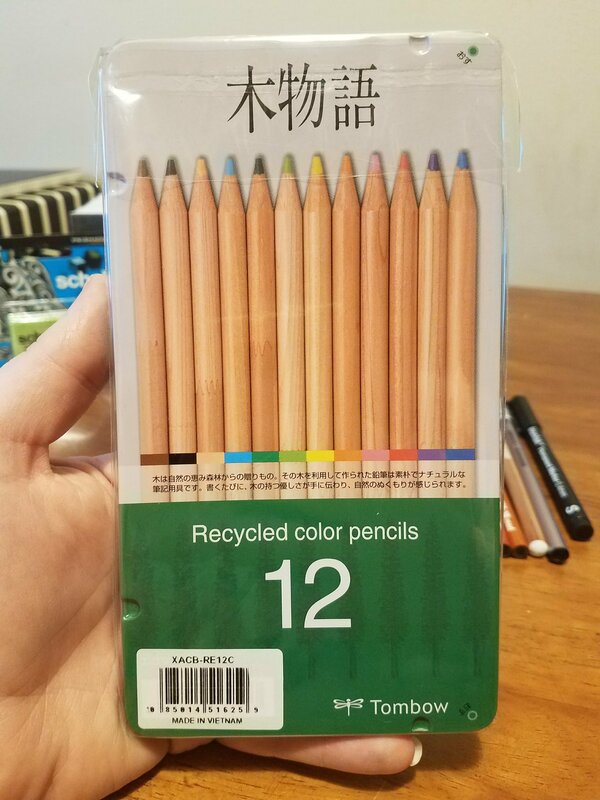 Even though Tombow is a Japan-based company, these were made in Vietnam. 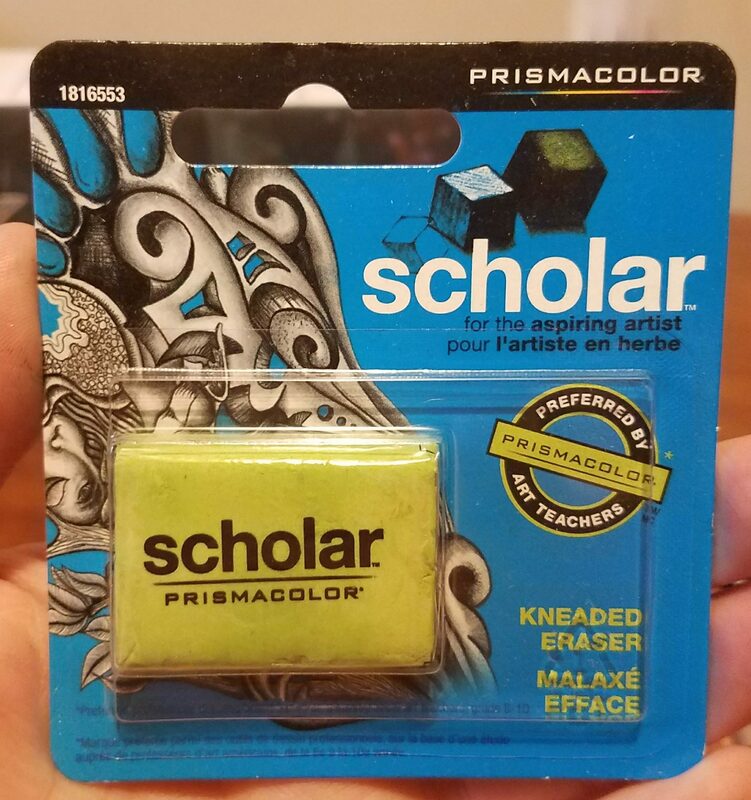 I have seen a lot of artists using kneaded erasers, so I was excited when I saw this in the box. Kneaded erasers can be molded and shaped in any way so that you can erase fine lines or wider lines. It can be used with chalk, charcoal, pastels and color pencils. Once you have used the eraser, all you have to do is knead it like clay for it to clean itself. Therefore, these erasers tend to last a while. Eventually, you will have to replace it, but really the price is so low, I wouldn’t hesitate to buy a few. So I get the concept of this and I have always wondered why there wasn’t an eraser that was just as fine as the line you were drawing. Well, now there is. I watched a video where the artist claimed that these erasers were amazing for him because he worked with very fine details. He claimed that although he had several kneaded erasers, they just didn’t get as fine as these did. These erasers are ideal for erasing graphite, ink, India ink and ballpoint pen. It is soft for smear-free erasing. I could not find these on the Amazon website, but Blick does have them for the price mentioned above. So, there you have it! A detailed description of all the items that came in July 2017 Grab Box. Be on the lookout for the next one as they sell out quickly. I know I will be purchasing the next one when it comes available. All in all, I feel like this box was very much so worth the price. Everything in this box is something that I will use in the future. If you would like to get your hands on this sketchbox, or any in the future, please use this link so that I can get a credit to use towards next month’s box. Those eraser pencils look amazing! Makes so much sense! Looks like you got a great box of stuff!! Awesome! !